ETCHMIADZIN (Armenpress)—The Mother See of Holy Etchmiadzin reported Friday that Supreme Patriarch and Catholicos of All Armenians, Karekin II, chaired a consultation of the Monastic Council and the resident bishops at the Mother See. 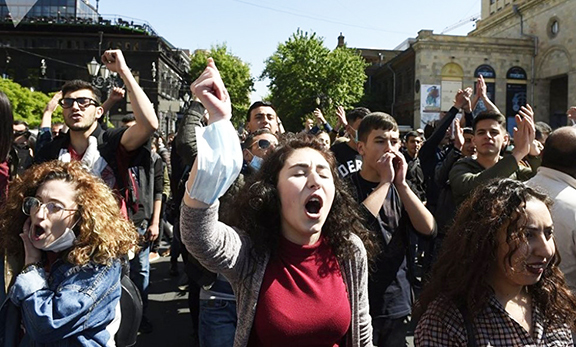 The meeting discussed Monday’s horrendous crime that was committed in Gyumri, and the ensuing protests by people in Armenia. “Our whole nation is now in pain and grief because of the inhuman tragedy, which had taken place in Gyumri,” Karekin II said during a speech at the meeting. “It is our expectation that all the offenders connected to the crime will be held accountable to the fullest extent of the law. We are confident that the relevant state agencies will take all necessary steps provided by law to completely solve the crime and convict the guilty. We express our concern about the events taking place during the public unrest on January 15, in the result of which there are wounded people. We call to our people to stay in peace and not to yield to provocations,” Karekin II said. Six members of the Avetisyan family — including a two-year-old girl — were killed, and a six-month-old baby wounded, in their house in Gyumri on Monday. Valery Permyakov, a serviceman of the 102nd Russian Military Base in the city, admitted to the crime. Permyakov was apprehended near the Armenian-Turkish border. Permyakov is being held in custody at the Russian military base. Tell Mother Russia to either help us or stop arming the Azeris. Soldiers languishing in their bases or killing an entire family is no where to be found in the signed treaties. I agree with his Holiness. We need to keep things in perspective. Tragedies like this are not uncommon. The Mei Lai massacre in Vietnam or a few years ago the US soldier who massacred 32 Afghans. These soldiers are in a stressful situation and some snap. Russia is guarding the Armenian/Turkish borders. Unless you people sitting comfortably in your living rooms in Glendale want to go out there and do the Russians work, COOL IT. “We call to our people to stay in peace….” ???? Mr Putin must punish Valery Permyakov SEVERELY and COMPENSATE Armenia (100,s Millions $..) and pay the effected family for all costs and future rehabilitation for the pain and sufferings.